SEO has changed a lot today. Everyone is talking about authority, backlinks, social media, keywords, Meta tags, on-page, off-page, etc. This can be overwhelming for someone who has just started learning SEO. The point of this article is to explain the most important parts of SEO in little definitions so any new learner can refer to the article, however it will be good to read the whole article from start to finish to get the basics of what SEO is all about. I am assuming you know a little about basic HTML, and how to use search engines but if you don’t, it’s Ok. You can always ask your web designer about HTML changes. In simple words, optimising a website to rank in search engine organic (free) results. SEO can be categorised in four main areas from start to finish, which are Keyword Research, On-Page Optimisation, Off-Page Optimisation and Social Media. Let’s go through each one by one in order of how I would normally implement these as part of my seo campaign, so consider this as a blue print to any successful seo campaign. Finding relevant keywords for which you wish to rank your website in search engine organic results. 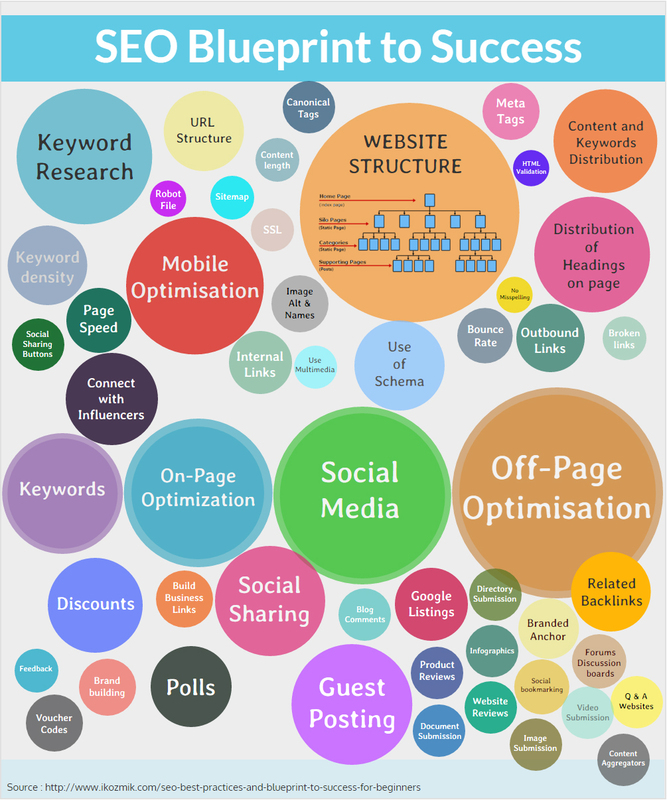 Here are the terms & tools used in keyword research. The word(s) a user enters in a search engine to search for something is called keyword. More than one word can be called keyword phrases, key phrases, or simply phrases. A keyword or phrase is also referred as search query or query sometimes. Another type of keywords are long tail keywords. These are made up of more than two keywords and typically have low searches to make them less competitive. Because right keywords will bring those people to your website who are looking for your products or services. Some important concepts for better keyword research are CTR (click through rate, percentage of people clicking through to your website out of number of times your website is shown in search results), and Conversion Rate (percentage of visitors buying your product out of total number of visitors). This is a whole field in itself because there are many tools available to do a research but you must use common sense as well because nobody knows your product better than yourself, so think what keywords you will use to find your products through search engines. Check keyword research for SEO guide by Rachel Sprung, its spot on for beginners. By definition, on-page optimisation means to make your website easier to understand for search engines. This cover everything you do to your website such as URL structure, content distribution to pages, good use of keywords or related keywords, Meta data etc. There are many factors so let’s go as many as we can, one by one. Depending on your website, you would have to structure your URLs for better SEO and user experience. The best structure is mywebsite.com (homepage), mywebsite.com/category (category page), mywebsite.com/category/product (product page), and mywebsite.com/information-page for e-commerce websites. Use topic heading in the URL and try not to use query strings i.e. mywebsite.com/this-is-topic-heading is the best option instead of mywebsite.com/topic?id=10. If your main website is not a blog, then your blog should be hosted on your website instead of a subdomain. So mywebsite.com/blog, and mywebsite.com/blogpost is a better structure instead of blog.mywebsite.com/blogpost. If you have more than one URL of the same page you can tell google by adding a canonical Meta tag to each page pointing to the main page so google consider all the pages as same entity. <link rel="canonical" href="https://www.thecanvasprints.co.uk/blog/top-100-wedding-photographers-northwest-uk" /> (add this canonical to all all the variants of this url such as https://www.thecanvasprints.co.uk/blog/top-100-wedding-photographers-northwest-uk?bpid=30 to tell google to consider only one URL. Sometime there are many URLs for the same content such as in e-commerce websites when you search for products, you can have a URL like mywebsite.com/search?keyword=blahblah or mywebsite.com/search?keyword=blahblah&color=white, both loading same products so google will get confuse as to which URL should be displayed in search results, so by placing canonical tags, you are telling google which page is the main page and which pages are acting as additional URLs. Make sure your website is structured exactly as your URL structure discussed above. Your home page should act as a hub to all of the pages on your website. It doesn’t mean you have to link every page from homepage but a good website structure is where all the pages are accessible within maximum 2/3 clicks, so if someone wants to go to your product page, they only have to go to homepage, then category and then product page which is two clicks away from your home page. Website navigation should act like a sitemap, so users can easily navigate to all the pages. Try to have navigation on the top or left pane as search engines read web pages from top to bottom in order of code. The content on the website should be unique. The best way to organise the content is to make a list of pages you would like to get ranked in search engines and distribute group of keywords to every page. Make sure to write the content around those keywords but also keep a balance between writing content for SEO and your visitors. Always remember you have to impress your visitors first and the only way to do this is by having engaging content on your website. Keep the most important content “above the fold”. This is the area which your visitors see without scrolling when they arrive on your website so basically top half or quarter of your website depending on the page length. The content in this area is given more importance by google because most visitors can either leave or continue to scroll down to see more content depending on what they see here. Try to write at least 1500 words for each page. More content means, you can target more keywords and google give preference to longer articles anyway. 500 word pages are long gone because they were mainly guest posts and spun articles which don’t work anymore. Besides with more content you can engage visitors more and decrease bounce rate. I have actually written 8000 words for posts and they have ranked without any backlinks so my conclusion is, the more words you target, the better it is. Although try to keep a balance between visitors getting bored with pointless content and visitors leaving within 5 seconds because of less content. I would suggest to read SEO copywriting secrets by Brian Dean and learn to write content for writing epic content. Make sure you have a sitemap xml file for your website and all your new pages are added to it automatically. If you are using an open source web framework, then it will have a sitemap plugin, so make sure it’s in place. If it’s a bespoke website make sure to ask your web developer to do this. Check build and submit a sitemap by google for more information on this. Sitemap contains all of your website URLs, so it’s good to tell search engines that these pages exist on your website and you want them in search results. Although not used much now-a-days but still recommended in case search engines are unable to find the pages. There are many Meta tags available now but most importantly make sure you have a title, description and keyword tag. Write your main heading in Meta title tag, a small description about the page in description tag, and few keywords in keyword tag (although less important but still good to use it). Meta tags are added in the page html so if you are not a web developer, you will have to ask your developer to give you the option of changing content for Meta tags in your web admin area for all pages or if you are using an open source there are always options available. Check this great article on how to write Meta tags. When anyone searches for your product/services and your website shows up in search results, google will use your Meta title and description tags to show your website to the searcher. Although now google sometime replaces it while showing results if they are not very much related to query, but you should still have a compelling title and description in case it is shown, to increase click through rate and to get more visitors. There shouldn’t be any html errors on the page. You can use W3C validation service to validate the html. It is not a very big deal but search engines always like a good written Html page so it is recommended. Obviously you may not require many sub headings but make sure you have at least one H1 heading and few h2 headings. Search engines want to know more about your content so by having main heading and many sub headings, they will know more about the topics you are trying to cover. Image alt tags are normally ignored but that’s not a good practice for two reasons. Firstly because sometime images are not loaded properly so users should be able to know what is the image about and secondly you can have more keywords on the page in alt tags and image names. Try to name your images related to your topic and distribute keywords on all image names on the page. Don’t overuse. You will be amazed to see how many visitors you can get through image searches in google so although google has a good technology of finding a related image but they still rely on image names and alt tags to find related images, so if your images are showing on top in image searches, you will not only receive more traffic but sometime searchers will use your image in their blogs/websites and link back to you. Any user coming on the website and going back without going to any other page on the website is bouncing back. You should try to write content which can engage users and keep them on the website for a longer period. Because search engines want to show users what they want to see and if users are spending much time on your website and not bouncing back, it gives a strong signal that they want to see your website. Keyword density is the percentage of how many times the keyword or phrase appears on the page compared to the total number of words. This used to be a good factor but google is smarter now and gone towards semantic search so always try to write the page content for people instead of search engine. Do not overuse keywords in your content, even having any keyword once or twice on the page is fine. It’s a simple file to create and you can find more instructions on robotstxt.org or ask your web developer to create this. You can use robot file to tell search engines which pages you don’t want them to show in search results as most search engines honour this file. Make sure the page loads in less than 4 seconds. Faster pages are ranked well and there are less drop outs resulting in less bounce rate. Just ask yourself, how long do you wait for a page to load normally before getting frustrated? Social sharing buttons help your website visitors to quickly share what they like. There was a myth once that outbound links will harm your page rankings but this is not true if you do it properly, in fact it is beneficial. Don’t link to just any website, link to a related authority website. Just imagine it as you are making a case to google why you should be ranked higher? Because you are backing your page content by referencing to an authority page which google already trust. One of the most important factor in getting higher rankings is how you link internally to your pages on the website. I would categories these in two types, one is when your pages are linked from menu/navigation and other is when you link a page from within the content. I would suggest to link to your important pages you wish to rank from within the content from other pages. This will give a ranking boost to linked pages quite well. Although it won’t affect too much in terms of seo but as a user point of view, it’s very annoying, so make sure you don’t have any broken links on the page. There are many benefits of using multimedia. 2. You can use keyword rich names for your images as discussed above. 3. You can use images from other websites and credit link to those websites and then contact them to let them know that you have linked, so they might socially share your page or link back to you. Always keep a balance, between content and multimedia on the page. Content is always more than multimedia because it effects page loading speed. Try to keep the image size low, you can easily do it in Photoshop while maintaining a good quality. Make sure you read the content many times before publishing and there are no spelling mistakes. No one wants to read poorly written content. There can be grammatical mistakes as not everyone has got a degree in English but you can avoid spelling mistakes at least. I wrote a detailed article on seo trends to follow in which I have explained all these terminologies. In short rich snippets, knowledge graph and breadcrumbs are additional attributes you can use on your page to let google know more about your brand and OGP is open graph protocol developed by Facebook to make your page social share ready. For more information please see the article mentioned above. If you go now and check how many visitors are coming from mobile, I bet it will be more than 50% of your website traffic. So whatever services/products you offer, make sure that your website work on mobile and it’s either using responsive design or have a mobile version. Google has already said in their blog that it is giving importance to secure websites more than non-secure websites so it is recommended to install SSL for the all the website pages. After you have done on-page, it’s time to start promoting your website. Off page optimization basically mean to promote your website to get links, mentions of your brand on other websites. Everyone has their own opinion of how much this effects the overall ranking of your website so it’s impossible to say unless you know google algorithm. I believe off-page is the most important part and your 60% efforts should be on getting relevant backlinks to your website. A link to your website from a different website is called a backlink. Just like discussed above in outbound links, when you are linking to a related source from your content, it is counted as a backlink for linked website. When search engines started they needed a ranking factor to rank websites in search results. Backlinks were the main ranking factors till few years ago, they still are but there are more factors in the mix now. Search engine count backlinks as a vote from one website to another website so make sure you try to get backlinks relevant to your content. For example, a senior doctor’s vote for a junior doctor will be much more valuable than say a pharmacist, so relevancy is the key here. There are two ways to link a website, through an image or text. When you link to a website through text, the text used to link is called anchor text. Anchor text is very important in any back linking campaign because search engines look at the text used to link as what the website is voting for. If you use too many keywords or phrases in anchor text, search engines can penalize you so you have to be careful with this. The best option is to use the company name or the topic title to which you are linking. Try to diversify the anchor text so you are not using the same anchor text unless it’s your company name or just leave it to people how they want to link to you. Let’s look at some off page optimization methods. If used properly forums and discussion boards can be your source to generate a lot of business and links as well. Find up to 10 high authority forums related to your topic or product you are selling. Start participating in the threads. Give solutions to other forum member problems. Do not create a signature with a keyword anchor text. Just use your company/website name in anchor text so if people find you helpful they can contact you easily. These are the websites used to store, and organize bookmarks so users can come back whenever they want and find useful bookmarks. This was once a great source of links but now it should be treated more as getting related traffic to your website and putting your content in front of people who would like to read it. Find top 10 social bookmarking websites with your product niche. Build your community by regularly posting content from different sources related to your product/services. Do not just post your own content and hope you will get anything out of it. It may actually get you in bad books of search engines. Share related resources from all around the world which people want to see to build your community. You will be amazed how much traffic you can get from these websites. My personal favourite is reddit as you get a lot of visitors. Check this great resource about how to promote content using social bookmarking by Lenka Istvanova. Once a main method of getting links but not anymore. Use directory submissions strategically to build your business reputation instead of getting backlinks. Choose some well-known and highly visited directories of your country such as for UK I will choose yell, yelp, thomsonlocal, 118118, or opendi etc and some online authority directories such as yahoo directory or DMOZ, add your business to these directories with a link to your website and company address. Do not submit to just any directory. Remember you are doing this to build a reputation of your business not for getting a backlink. Just like forums these question and answer websites are a gold mine for getting related visitors. Find few top Q&A websites in google such as yahoo answers, quora or ehow. Answer questions related to your niche and become authority in your field. Include references to your articles or other forum threads in your answers. Do not use anchor keywords to link back to your website, just keep it simple and authentic. The main aim here is to help people with your knowledge. Obviously this will only apply if you have a video to share but this works very well. You get a lot of traffic from videos as google show them in search results as well. Find as many high quality video websites as you can, create your channel, share your videos and build your community. Don’t forget to tag keywords related to the videos as search engines will mostly use those tags to find out about the video. Add a good description of the video. A very good resource of traffic as many people go to image sharing websites such as flickr, tumblr etc to find images for their projects. Create a list of high authority websites where you can submit your images. Make sure to name the images properly and add alt tags of what the image is about. Do not forget to put a description for the image and a note saying that the image was taken from your website so if anyone wish to use this image please don’t forget to give back credit. You will get a credit link this way if someone uses your image. May be not for beginners but it’s not too hard to do an infographics. It’s a great source for getting backlinks if done properly. Find a hot topic related to your niche. Get a good designer to do the infographics. People may be more interested in content than design but it’s still important. Find top infographic sharing websites such as visual.ly, reddit and submit to those. You can also reach out to different bloggers who have already shared similar infographics and get yours featured in their blog. Do not use same description for all submissions. Try to use unique description for each infographic. A great source to get traffic is by sharing documents on document sharing websites such as slideshare. These websites are high authority so if google finds anything related on these they are shown in search results. Create a PDF or PPT document with unique content and submit to these websites. You can create a good presentation of your product/services or any content page and upload it. These were once used to build backlinks but now they should really be used to build relationship with other bloggers. Find blogs related to your niche with high traffic and comment on related topics. The main aim here is to build a relationship with the blogger and share your knowledge. Do not use anchor text keywords to link back to your website. Only use website address in your signature so people can contact you. List your business with google to appear on google maps, places and search results for local searches such as “products in London”. Go to https://www.google.com/business/ and register your business. Do not forget to verify your business. Google will send a code by letter to your business address which you will need to enter online to get listed. Get reviews for your products/services and get them published on review websites. This will not only increase confidence for your potential customers but google will also show your review stars in search results if you implement rich snippets. Find 2/3 top review websites. Most of them are free to get listed but charge for additional services normally. List your business there and ask your customers to review your product/service on those websites. Do not try to buy fake reviews as it will not work. If you have an e-commerce website, an excellent way to get some promotion is to send products to different bloggers to get reviewed. Bloggers will normally use your product and give their honest opinions, some offer video reviews as well which is even better. You can either find bloggers interested in your products through google or there are few websites who are sort of a platform where you can put your product and ask bloggers to review. Once you have found the number of bloggers you want to hand out your product to, than all you need to do is simply ask them if they are interested in your product to review and send them the product. If you can afford to send products to video bloggers that is even better and get them featured on your website. Do not ask them to link to your websites with a keyword anchor text, just let them link naturally. Posting your content on different blogs is called guest posts. It still is a very good source of getting links/traffic if used strategically. Like many old methods of getting backlinks this has been abused a lot so google has put some restrictions on it. Make a list of top 10 websites where you would like to post your content. Make sure they are related to your niche and get good amount of traffic and have a good authority. Now look at the websites and see what sort of topics they like to cover. Create a list of up to 5 topics for each website you would like to write on. Send your ideas to the editor with a small description on each idea about what would you write on. Write a good quality post of minimum 1500 words, and include a good amount of related high authority links to resources including yours and get it published. The aim is to put your content in front of people and get recognition as an authority in your field. High authority blogs get a lot of traffic so if they like your content, they will definitely visit your website and become your customer. Do not use anchor text keywords and Do not write solely for the purpose of getting backlink. These are good source of showing your content to other bloggers as content aggregator websites such as alltop.com, blogengage.com etc can send you a lot of traffic and potentially new link building opportunities. Find the list of top 5 or 10 content aggregator websites. They cover all niches so you will be covered. Submit your feed to the most related niche. Very first step in social media marketing is to choose up to 5 social media channels where you would like to promote your website/products. Different social media channels work differently for different niches. For instance twitter is good to build social links, and getting business contacts. Facebook is good for building community centred toward your products, giving voucher codes, free products and getting reviews plus sharing your product images. Pinterest is a good source of traffic if you have lot of images on your website and so on. So you need to identify which social media network will work best for you. The best way is to try promoting on all major ones i.e. Facebook, twitter, google plus, LinkedIn and see which one works best for you. Make sure to build your social community by sharing interesting topics related to your niche, your own topics, product images, case studies etc. If you are selling B2B than social media is your opportunity to build business links and put your product in front of potential customers. Social media works almost same as media where you can build your brand image and get long term benefits. Reply to your customer queries on social media so people understand your product better. Influencers are people who are authority in your field and have large following. Try connecting with them through social media, follow them, get advice and put your product/service in front of them to get their review or endorsement. Get feedback from your customers about your product to know how you can improve. This will also help potential customers to turn into customers. Share this feedback with your followers. Once you have a good number of followers, you can start polling about related topics and hand out your products as prize. This will keep your followers engage and they will know more about your product. Give your customers an option to get discount on their next purchase if they share about their experience. This will not only give you a positive review but also increase sales. Generate voucher codes regularly and share with your followers. As this post was for beginners, I have tried to explain things the easier way. There are many concepts and ideas still to learn which I haven’t discussed here but I can safely say if you can implement this blueprint and learn more about every method in detail, you will learn advance techniques with time.